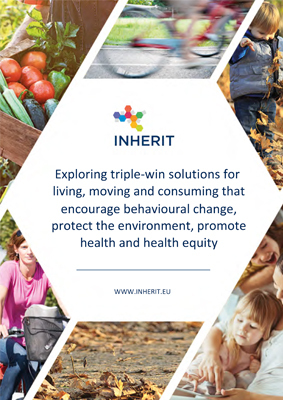 Exploring triple-win solutions for living, moving and consuming that encourage behaviour change, protect the environment, promote health and health equity. The state of the environment, our health, and levels of social equity are closely interrelated. The role that individual behaviours play in moving to more sustainable societies has been under-emphasised and can be a powerful entry point for change. Many measures to protect the environment also improve our health and at the same time reduce inequalities, but work is needed to fully harness and develop the combined benefits. These are some of the findings presented in the INHERIT Baseline Report, which investigates the links between behaviour, health, environmental and social resilience. The report looks at what can be done to encourage lifestyles, which protect the environment and promote health equity by focusing on the way we live, move, and consume. It is based on a review of scientific literature and framed by the INHERIT model which is presented in the report.